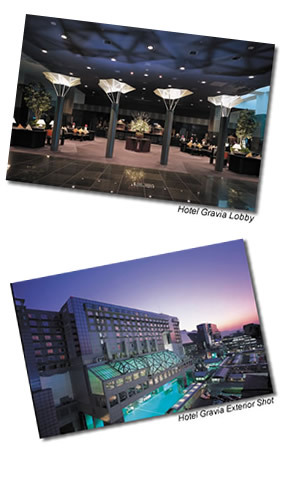 The 21st Annual FIRST Conference will be held at Hotel Granvia Kyoto at Kyoto Station, Japan. Hotel Granvia Kyoto is an integral part of the architecturally striking masterpiece, the JR Kyoto Station Building, which also includes a department store, museum, musical theater, and a vast underground shopping mall. From here, hotel guests have direct and easy access to/from Kansai International Airport and major destinations across Japan including Osaka (30 min. ), Tokyo (2.5 hr), Hiroshima, Nagoya, and Fukuoka. The hotel is located atop JR Kyoto Station. A block of rooms is being held for conference attendees at a discount rate. Standard discounted rates range from 21,500-25,000 JPY (approximate$231.45-$269.13 USD; approximate €168.55-€195.98 Euros*) depending on room type and dates of arrival and departure. Standard discount rates have been extended through to the conference! Book Now! Reservation requests received after June 1st will be accepted on a space and rate availability basis. It is recommended that reservations be made using Granvia's online reservation system. Visit www.granviakyoto.com and go to the "Reservations" section. Click on "Travel Agent / Corporate Booking" (see the image below). A new window will pop open, enter the word "FIRST" (all capital letters) in the "Promotional Code" box. Leave the "IATA" box blank. Click "Save". Next, select your arrival day and departure days on the availability calendar, or on the date dropdown and click "Show Availability". If you are registering before March 31, 2009, you will see the "FIRST CONFERENCE RATE - EARLY BIRD". Click on that to show the rate. If you are registering after March 31, 2009, you will just see "FIRST CONFERENCE RATE". If you are happy with your selections, click on the rate that dropped down in step 4, an "ADD TO ITINERARY" button will appear. Click on it to review your accomodation selections. r-rsvtns@granvia-kyoto.co.jp. Please ensure to mention you are attending the FIRST Computer Security Conference.